FIPS 140-2 Level 3 certified, AES 256-bit. Keeps your data safe! Benchmarked Speed: 10MB/s and up, comparable to other high-end FIPS-certified hardware-encrypted drives. Random read/write of small blocks comparable to non-encrypted retail drives. Your portable apps hum along just fine! 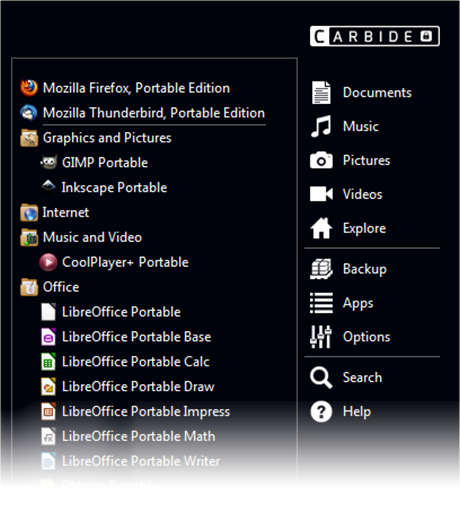 Bundled with every Carbide drive is an amazing collection of portable apps to keep you happy and productive all day long... all for FREE! The LibreOffice office suite is compatible with Microsoft Office, the GIMP image editor is compatible with Adobe Photoshop, the Inkscape vector editor is compatible with Adobe Illustrator. Mozilla Firefox, Portable Edition lets you browser your favorite sites. And there's a secure password manager, integrated backup, and lots more. If you'd like to exchange or return your order, please email store@customusb.com and we will email you a prepaid shipping label. Drives that have been laser-etched can not be returned, but we'll happily exchange/repair drives with any issues. Note that engraved drives can be exchanged but not returned. If you're having a hardware issue with your drive, please email store@customusb.com and we'll promptly get back to you with the details on processing your return or warranty claim. Support for your handy portable software can be found in the PortableApps.com Support pages as well as our online forums. Support for DriveSecurity is available within the ESET knowledgebase. Note that there is no phone, email, or online forum-based support available and that the 5-year license can not be transferred to another device. We provide a guide to Reinstall Clevx DriveSecurity on the PortableApps.com Carbide with links to the appropriate downloads as well. PortableApps.com is the world's most popular portable software solution allowing users take their favorite software with them. A fully open source and free platform, it works on any portable storage device (USB flash drive, iPod, memory card, portable hard drive, etc) or cloud drive and lets users carry their favorite desktop software with them and use it on any computer. With millions of users worldwide, hundreds of apps, and over 300 million downloads, PortableApps.com is the most complete solution for life on the go. CustomUSB is a service oriented custom memory products manufacturer. In 2012 alone we produced more than two million USB drives for customers ranging from non-profit organizations to Fortune 500 companies. We also do project management and manufacturing for customers who are looking to create USB product replicas and USB based retail products. 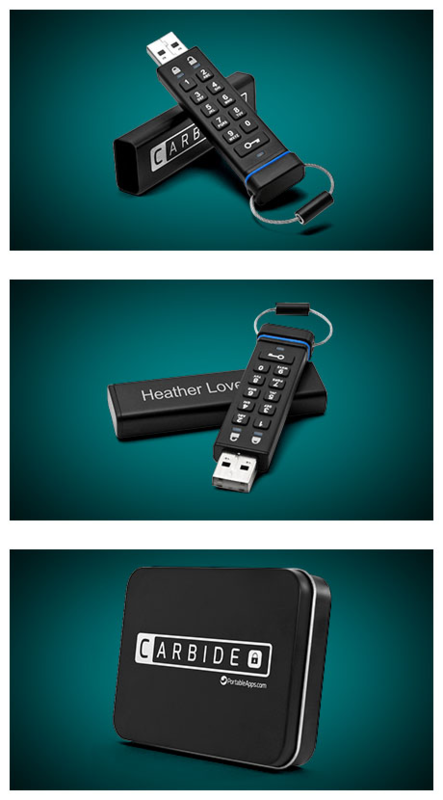 In December of 2011, we have launched a web store allowing customers to buy cool, high-capacity flash drives for personal use. We are also an exclusive custom USB flash drive supplier for SanDisk and PortableApps.com. Mozilla® and Firefox® are registered trademarks of the Mozilla Foundation and are used under license. Adobe, Photoshop and Illustrator are registered trademarks of Adobe. PortableApps.com is not affiliated with Adobe. Microsoft Office is a registered trademark of Microsoft. PortableApps.com is not affiliated with Microsoft. DataLock Secured USB drive and DriveSecurity powered by ESET portable antivirus application incorporates technologies licensed from ClevX, LLC. DriveSecurity and DataLock are trademarks of ClevX, LLC. ESET and NOD32 are registered trademarks of ESET Noth America.